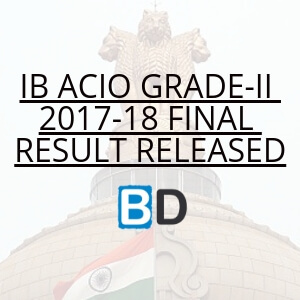 The results of the IDBI PO PGDBF Exam 2016 – 2017 was released in the start of this present month and this result was a long awaited one, as there were news surrounding the merging of the bank with others and the results came atlast. The Exam of the IDBI PO PGDBF was held on 3rd February, 2017 and this happened long back ago. 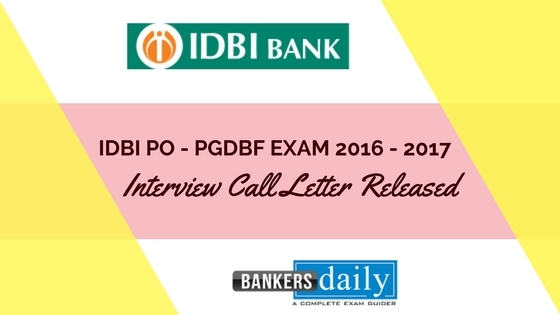 Now, IDBI has released the call letter for the IDBI PO (PGDBF) Exam 2016 -2017 Interview and the candidates who have cleared the Phase I of the IDBI PO (PGDBF) Exam 2016 – 2017 is eligible to attend the interview. Please note that , IDBI Bank has entered into a MoU with Manipal Global Education Services Private Limited (MGES), Bengaluru to provide training in Banking and Finance to prospective candidates aspiring to join IDBI Bank as Assistant Manager Grade ‘A’. IDBI Bank invites applications from young, dynamic graduates for admissions in Manipal School of Banking, Bengaluru for 1 year Post Graduate Diploma in Banking and Finance (PGDBF) comprising of 9 months of classroom studies at MGES Bengaluru and 3 months internship at IDBI Bank’s branches. After the successful completion of the course, the candidates will be awarded PGDBF from Manipal University and will be inducted into IDBI Bank as Assistant Manager Grade ‘A’ subject to fulfillment of eligibility criteria. The Total number of vacancies available for the IDBI PO – PGDBF EXAM 2016 – 2017 is 1000. 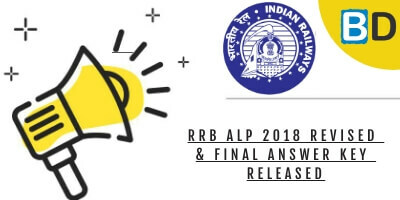 The Canara Bank PO and the SYNDICATE Bank PO also follows the same pattern as that of this Exam and these exams too have the Course duration as 1 year and the appointment of the candidates is subject to the successful completion of the course. Candidates can download the Call Letter and also the Curriculum Vitae which is provided as a link in the below given fields. This IDBI PO PGDBF Exam has also released the PDF format for the Curriculum Vitae which many banks and other PSU’s will not provide. So this starts or marks the new process in the interview , where the organization itself provide the format for the Curriculum Vitae for the Interview process. Candidates can also download the Reprint of the application form which is essential for the Interview Process and IDBI has also provided the links to download the Application Reprint. Please find the links in the bellow given fields. During interview candidates will have the option to answer the questions in Hindi or English. Applicants qualifying the personal interview shall be considered for final shortlisting. 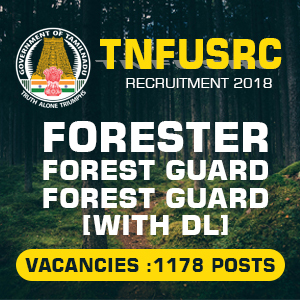 Candidates can also check the Marks of them in the links provided below. Also this will give them the edge to prepare for the other exams and also knowing the cutoff marks will be useful to usher their preparations to the next level. Alternately candidates can view the results of the IDBI BANK PO PGDBF EXAM 2016 – 2017 which is already mentioned in the Bankersdaily from the below links. Also candidates can check the cutoff marks of the IDBI BANK PO – PGDBF EXAM 2016 – 2017.